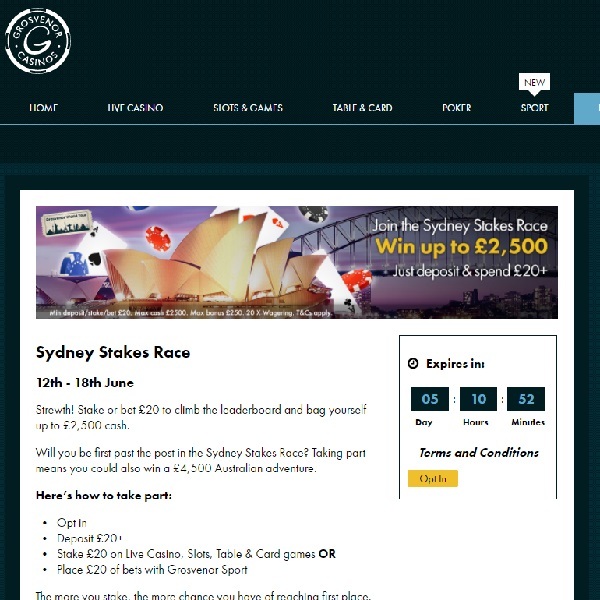 Grosvenor Casino is in the middle of its Sydney Stakes Race and you have until Sunday to enter and win up to £2,500 cash. All you have to do is opt in to the competition and deposit at least £20 at the casino. Then bet £20 on the casino’s live dealer games, slots or card and table games. Alternatively you can bet £20 over at Grosvenor Sport. You then need to work your way up the leaderboard. Top prize is £2,500 cash, second prize is £1,000 cash and third prize is £500 cash. There is also £6,750 available in bonuses for the an additional 245 players that don’t make the top three. To top it all off, with every five Play Points that you collect you will earn a Grosvenor World Tour Air Mile and an entry to the prize draw to win a £4,500 touring holiday for two to Australia.